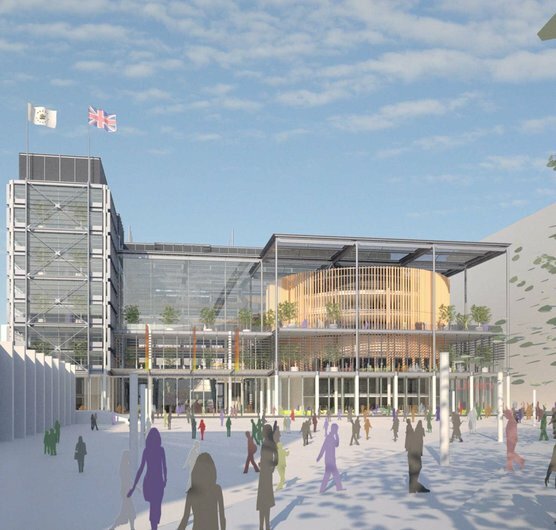 Hopkins Architects' design for the new Brent Civic Centre has been granted planning consent with a unanimous vote. The new building, to be located opposite Wembley Arena and close to the Wembley Stadium, will realise Brent Council's vision for a community building consolidating the efficient delivery of services to Brent's diverse communities and paving the way for regeneration of the Wembley Masterplan northern area. Having recently completed a new Civic Building for Hackney, Brent's new Civic Centre is a further step toward establishing an efficient and sustainable model for civic buildings delivering public services. Located in the heart of Wembley, it will become a new landmark and public 'place' for the residents of Brent providing a wide range of community facilities under one roof, as well as accommodating 2,000 council staff and councillors. Within the Civic Centre, Hopkins has designed a new multi-purpose community hall, which will accommodate Theatre, Concerts and large Wedding receptions. The large foyer and atrium has been designed as a flexible space within which a large public staircase will become seating for 'Wembley Live' performance events. Other functions will include a one-stop shop and a state-of-the-art library and learning centre. The building aims to achieve BREEAM 'Outstanding' through a combination of solar shading, natural ventilation, façade performance and combined cooling, heating and power utilising waste vegetable oil.